Mr. Haas joined the PA/NJ community Boards in 2007, serving as their treasurer until 2011. During that period, he also served on the NSC Budget and Finance committee and the NSC Investment & Treasury committee. In 2011, he became Board Chair of the two New Jersey communities, which lead to his appointment to the NSC Board in 2012. In 2015, he became Board Chair of the two Pennsylvania communities; in 2016 the two Massachusetts communities; and ultimately the seven community Northeast region, all of which Fred chaired until March of 2018. In his professional career, Fred was a tax partner at PricewaterhouseCoopers, from 1978 until 2001, when he retired. From 1972 until 1982, he served in various positions on the professional staff at Coopers & Lybrand. After graduating from Penn State with a degree in accounting in 1966, Fred served as an aircraft maintenance officer in the USAF until 1971. Mr. Valerio, Director Living in Community at Cedar Crest, spent the majority of his career in sales and marketing management for Schering Corporation, a division of Schering-Plough Pharmaceuticals. At retirement, he held the position of director of marketing administration. A graduate of Northeastern University College of Pharmacy, Mr. Valerio was president of several home school associations, treasurer of the local Boy Scout troop, and long-time volunteer at Liberty Science Center. 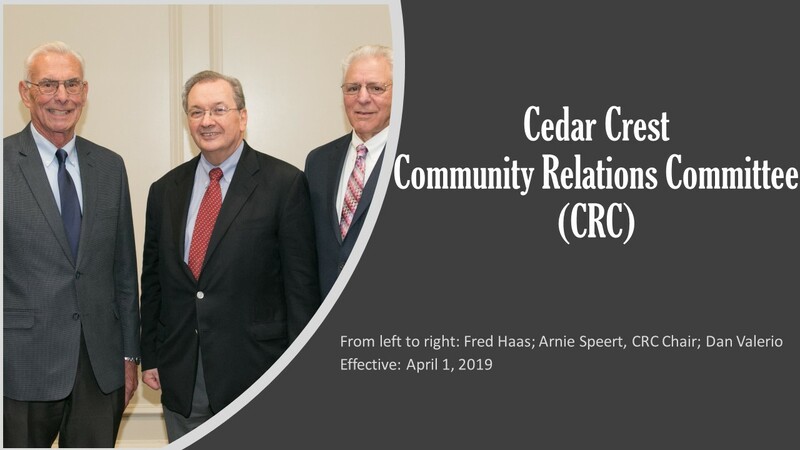 At Cedar Crest retirement community, he is cantor and a member of the choir at Catholic Masses; treasurer of the new Model Railroad Club; member of the Chorale; and past president of the Resident Advisory Council. He also was chair of its Conservation Committee.